Little did Thomas Azbill know just how big music would become in his son's life when the first-grader asked how to play his guitar. Today, Brandon Azbill still loves music, and he plays classical guitar professionally and plans to one day teach at the college level. The 22-year-old's interest in guitar began when he was a youngster at Cecil Sly Elementary School. "He lent me his guitar," Azbill recalls of his father. "My dad taught me a few things for maybe two weeks — something like that — and then they got me guitar lessons from there." Blaine Cameron gave Azbill guitar lessons at Ochoco Elementary School for a few years. "At first, I did acoustic guitar and finger-style things," Azbill says. "I've played rock, and I had a band when I was in middle school, and I played blues." He graduated from Crook County High School in 2014 and then started getting into jazz while at Central Oregon Community College, where he earned an associate's degree in music. "I love jazz, I still do, but I don't play it. There just weren't a lot of people that I could play with," Azbill said. "More recently, I've done classical, and since I've done that, there's been no turning back." He says jazz involves other musicians and is challenging to play alone. "You can play it by yourself if you're on an instrument that can do accompaniment and melody at the same time, so I was trying to do this, and I ended up buying a classical guitar," Azbill says. A folk type of instrument has metal strings where a classical guitar has nylon or some sort of synthetic material. "When you play classical guitar, you play not with a pick but with your fingernails, and you have essentially five picks instead of one, so you can balance parts and do more." He then started playing his classical guitar solo. "I really love being able to play by myself with having a full melody and accompaniment and not have anyone else," he said. "I started studying classical guitar at that point, and I fell in love with it." He says it's great to play with other people, and he often does. "But my passion is in solo music," he said. "Classical musical is written out for you, and you play larger works that tend to have more structure and length than jazz does. 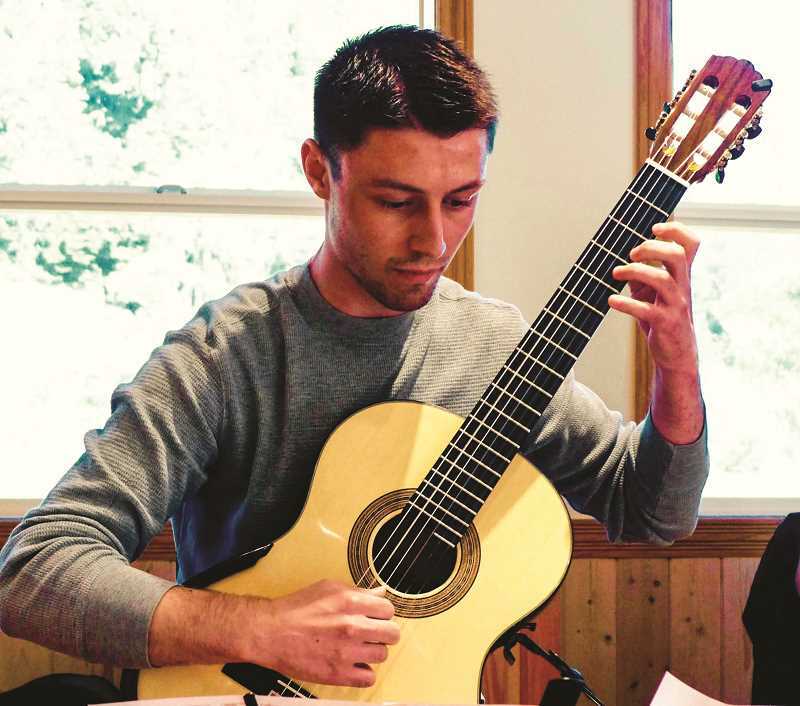 Azbill transferred from COCC to Portland State University, where he will graduate this spring with a bachelor's degree in classical guitar performance. From there, he will go straight into the master's degree in classical guitar performance at PSU. Once he completes that degree, he will go on to get a Doctorate of Musical Arts. Since no Oregon universities offer that degree, he will most likely have to go to the East Coast. Ultimately, Azbill wants to teach guitar at the college level and perform in classical guitar organized events. And, he's no stranger to the classroom. He taught music at St. Thomas Academy in Redmond for a year and currently works at Solomon Guitar Studio in Portland with 25 or 30 students. This winter, he also started another teaching job at Oregon Episcopal School in Beaverton with a handful of students. He plays in PSU's Guitar Orchestra and has played with the Central Oregon Symphony, Opera Bend, and as a soloist with the Community Orchestra of Central Oregon. 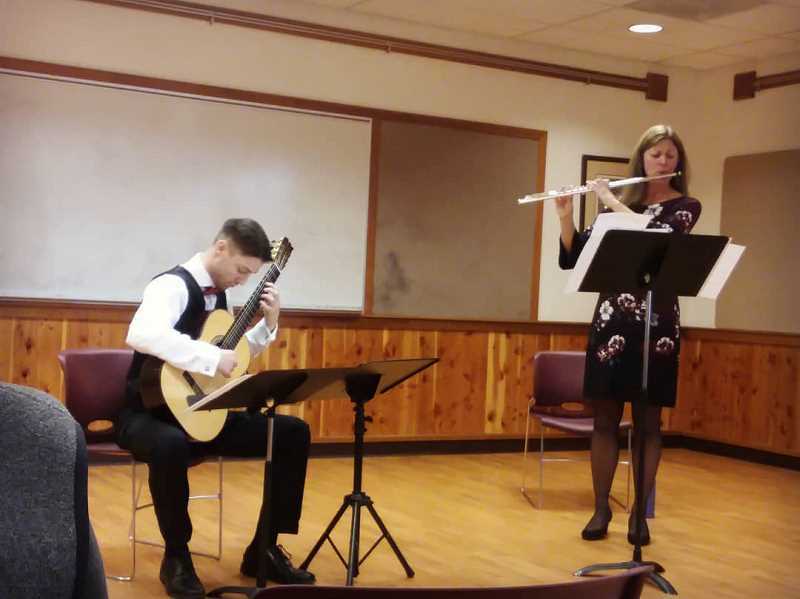 Last fall, he played his classical guitar with Central Oregon Symphony's flutist Stefanie Janin at the Crook County Library during a Music in Public Places performance. He and Janin are scheduled to play at COCC's Willie Hall in Bend at 2 p.m. Saturday, March 2. Azbill says he's studied under around 25 musicians during his lifetime, but three stand out as being most influential. Cameron, his first teacher, was a big influence, providing him with the very basics of guitar. "In Bend, when I was playing jazz, Rich Hurdle was very, very helpful to me personally and musically. He brought me a long ways," Azbill says. His current teacher, Jesse McCann, has been the most helpful recently. And then, there's his father. If his parents, Thomas and Kim, had not recognized their son's hidden passion and allowed him to pursue it, who knows where he would be today — certainly not on the path to a Doctorate of Musical Arts. "I've always loved listening to music, and I still listen to music a few hours a day. I enjoy music as a consumer to listen to it," Azbill says. "And I love playing guitar – especially studying it. I love studying music, I love teaching it, and I enjoy listening to it, too. It's pretty much all I do on a daily basis. From morning 'til night is music. I can do that because I love it."